Tall Ships coming to Australia and New Zealand. Four Tall Ships will be sailing in Australia and New Zealand waters from August 2013 as part of their global circumnavigation. The 'Tecla', bark 'Europa', 'Oosterschelde', and 'Lord Nelson' are wandering the world's oceans and following the old trade routes of historic times. You can be part of this adventure as a guest crew member and join any one of the ships on a voyage in Australia or New Zealand. Whether you are a sailing-buff or just an adventurous spirit, the Tall Ships can cater for your level of experience. Sailing experience is not required as the crew onboard is happy to explain navigation, sail handling, rigging, square rig sailing technique and more. As part of the ship team you will sail to new horizons and experience all aspects of a sailor's life on board: the wind, the ocean, new friends and adventure. While traditional on the outside in order to maintain their links to yesteryear, the 'Europa', 'Tecla' and 'Oosterschelde' have been decked out with modern conveniences below deck, each having areas to relax, take time out, and enjoy the convivial atmosphere onboard. All are classed as Tall Ships and have been faithfully restored, each having its own specifications and history of true sailing. The Lord Nelson (1984) is a pioneer in the sailing community as a Tall Ship designed and built to enable people of all abilities, including physical and sensory disabilities, to sail side-by-side on equal terms. The ship has many added features to ensure a safe and enjoyable sailing experience for all. The permanent crew onboard are professionally trained and medically qualified. The Lord Nelson offers a sailing experience for everyone! 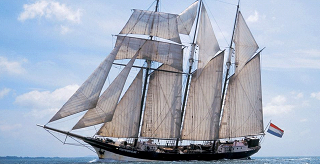 The bark 'Europa' (1911) is the largest of the three Tall Ships at 56 metres, with 16 crew and a sailing capacity of 48 persons. She has developed a reputation as 'the ship that really sails' and has travelled the world's oceans for many years. 'Europa' has four 2-person cabins, four 4-person cabins and four 6-person cabins. All have ensuite toilet and shower. Europa has seven voyages in the Australasian region in 2013 - click here to view. The three-masted topsail schooner 'Oosterschelde' has already made one global circumnavigation since her restoration in 1992. She is 50 metres long with six crew and a sailing capacity of 24 persons in six 2-person cabins and three 4-person cabins. All cabins have a wash basing with cold and hot running water, and shared shower facilities. 'Oosterschelde' has seven voyages in the Australasian region in 2013 - click here to view. The family-owned 'Tecla' (1915) is the smallest of the three ships at 38 metres with a crew of three and capacity when sailing of 16 persons. She has been restored as close to original as possible. 'Tecla' is a two-masted gaff Ketch with topsails, and has eight 2-person cabins with private shower and lavatory. 'Tecla' has seven voyages in the Australasian region in 2013 - click here to view. The Lord Nelson (1984) is one of two Tall Ships to be have been designed and purpose-built to enable people of all abilities to experience sailing side-by-side without restriction. She carries a highly skilled and trained permanent crew and a sailing capacity of 40. Features onboard include wheelchair lifts, wide aisles, signs in Braille, power assisted and 'joystick' steering, and a speaking compass. The eight spacious cabins are suitable for wheelchairs, fitted with shower seats and have adjustable basins. 'Lord Nelson' has ten voyages in the Australasian region in 2013, including several between New Zealand ports - click here to view.